The pig iron blast furnace provides the means by which iron is rapidly and efficiently reduced from iron ore and it is the basis for all primary steelmaking. The structure of pig iron blast furnace is made of steel plate and refractory bricks,and its shape is vertical drum like bowling pin. 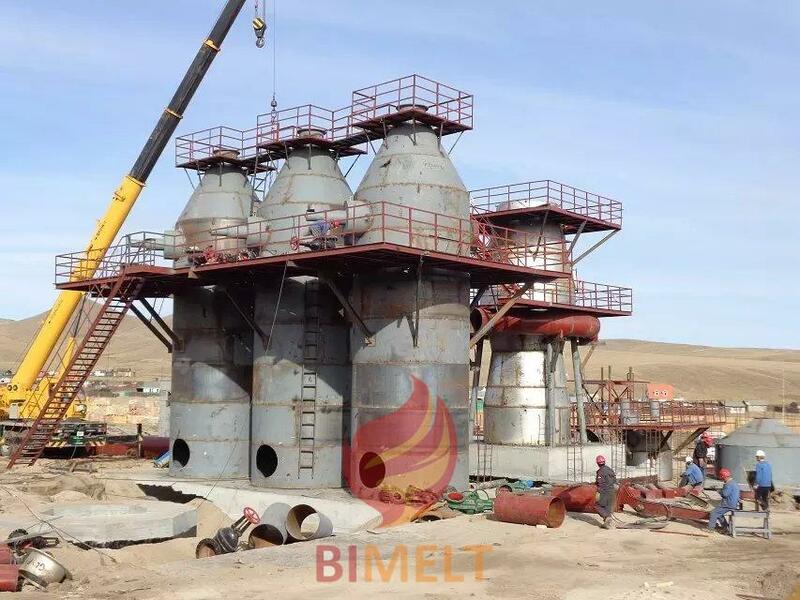 The insides of blast furnace can be divided into hearth, bosh, belly, stock, throat, etc., the top of furnace is installed with furnace top equipment. The bottom of hearth has iron tapping hole, and above this hole there is slag tapping hole, but the location of two tapping holes are not on the same plumb line. At the upper part of furnace hearth,there are many tuyeres around the lower part of bosh, they are connected with hot air pipes of hot blast stove. The number of tuyeres are decided by theinner size of hearth, the center of tuyere is about 1.2m. The part abovefurnace throat is furnace top, there is installed with double or three bell andhopper for preventing in-furnace gas leakage, and it also can distribute rawmaterial in furnace. Near to the lower part of furnace lid, there are four exhaust pipes around furnace wall, and these pipes finally integrate to one down comer outside the furnace, the connectedwith the dust collector. 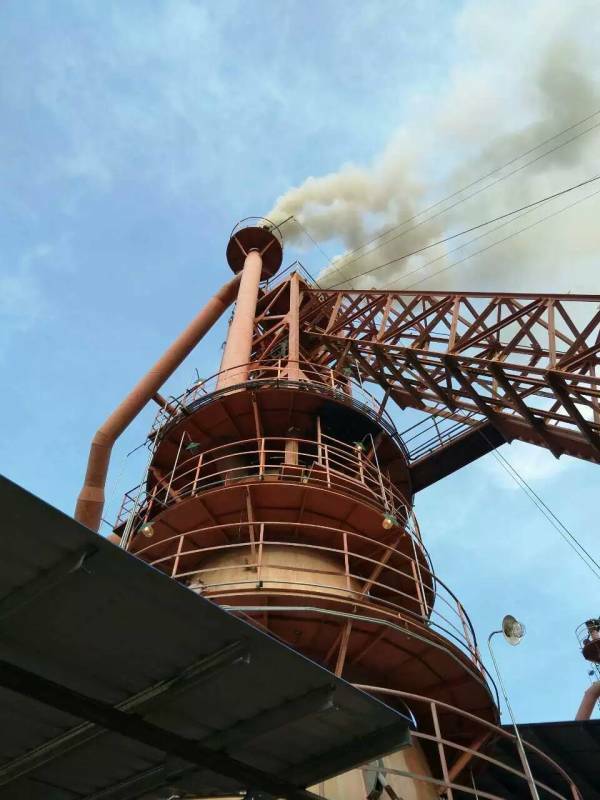 Since the refractory lining of whole blast furnace proper keep under high temperature condition, so it need water cooling in order to prolong the service life. 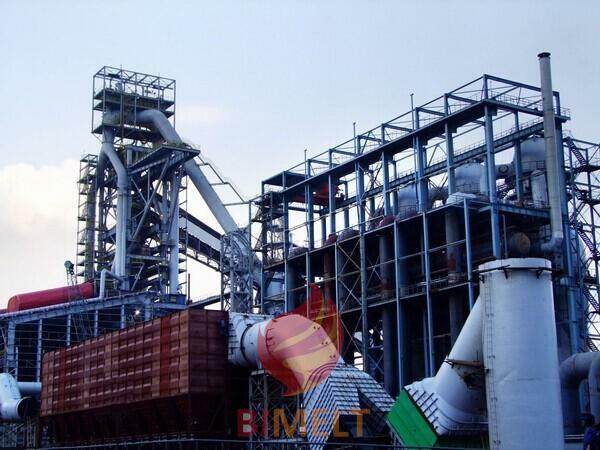 If under good operation condition,the life of blast furnace lining can achieve the yield of 6 million tons. 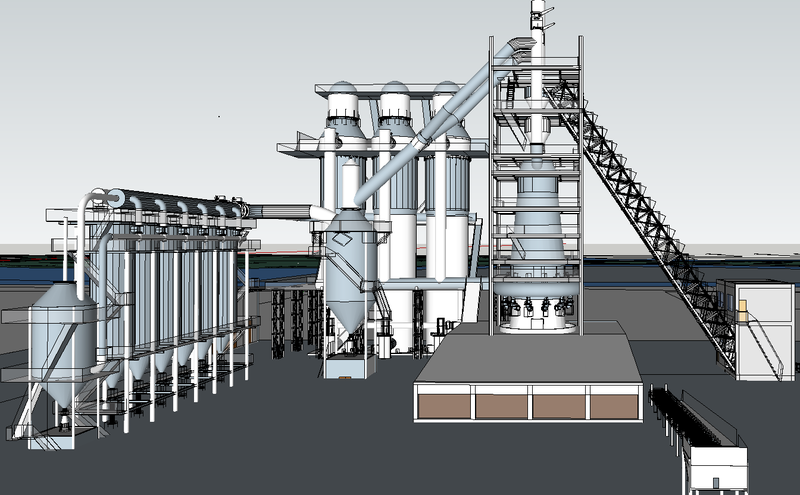 Bythen, the plant need to completely shut down and repair the refractory lining. 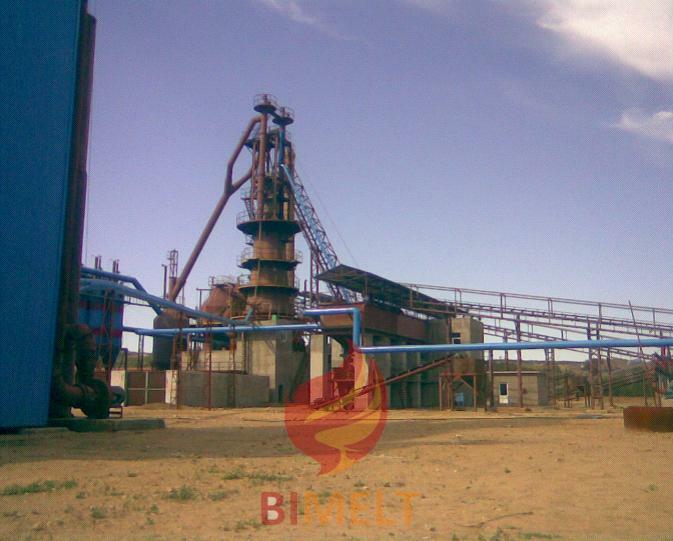 The main raw materials put into blast furnace include ironore, coke and limestone, and main iron ore are hematite (Fe2O3), magnetite (Fe3O4)and limonite（2Fe2O3.3H2O）. The iron content of iron oreput into blast furnace is about 60%, in recent years, the blast furnace has adoptedsinter and pellet after sintering processing, and without directly charginginto furnace. These charging materials are called iron-bearing material. As forthe consumption of charging material per ton of output of pig iron, it depends on the iron content. The main charging flux is limestone (CaCO3). Sometimes also use dolomite (CaCO3.MgCO3) depending on the difference of charging materials. The function of flux is to collect gangue in iron ore,especially silicon dioxide(SiO2) andcarbon in coke, reduce the fusion point and produce furnace slag, then tap out the slag. 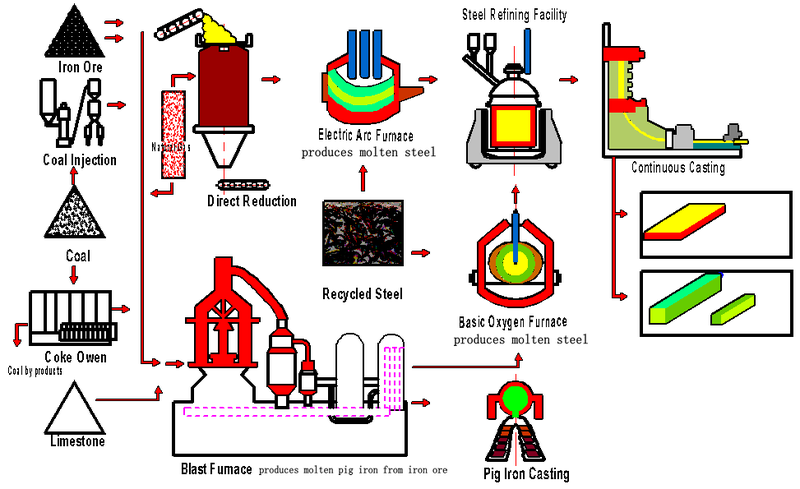 The consumption of flux is about 200kg~250kg per ton of pig iron output. Other than the above raw materials, the smelting of pig iron must blow a large capacity of air in to blast furnace at tuyere, the oxygen in air will react to coke, supply thermal power and reducing gas. 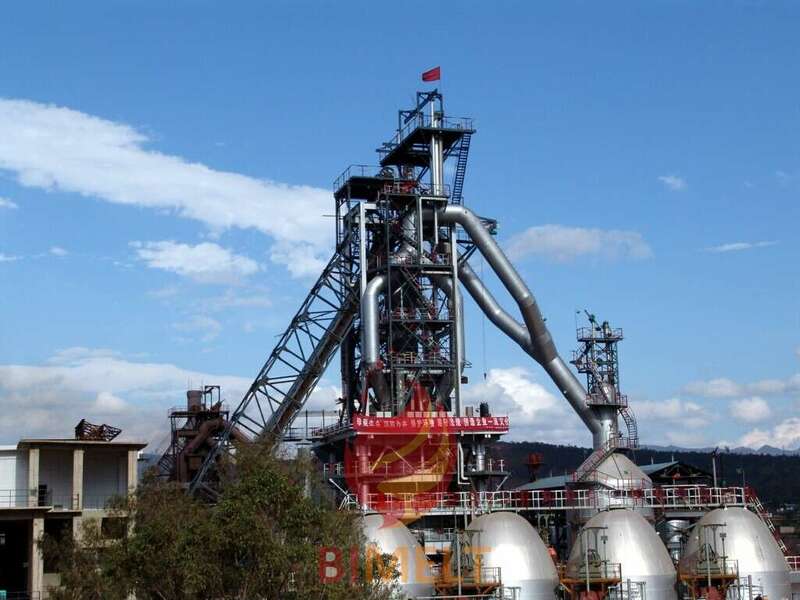 The blast airmust have enough pressure and volume to blow through every part of blast furnace, and resist the fast dropping of raw materials charging from furnace top.